Aval Squash Payasam - When I am in a mood for something sweet, this is the one dish that comes to my mind..... simply yummy and delicious. It hardly takes 20 mins to make this dish. 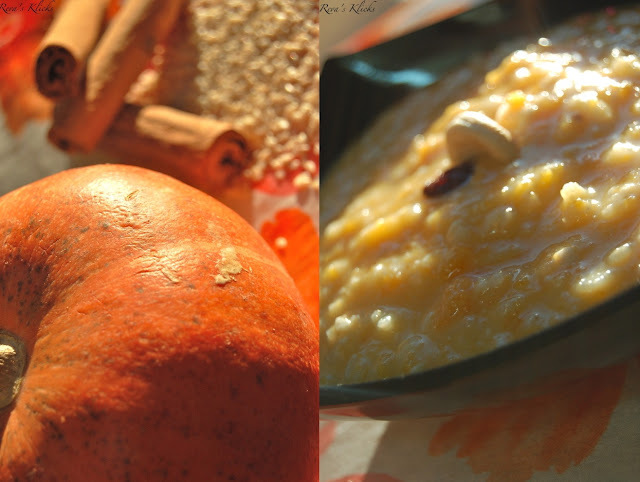 The payasam has a soft texture from the aval and squash with a underlining of a crunchy bite from the peanuts. This is one of my favourite recipe when it comes to having something simple, tasty and healthy. It is quite an unusual combination of ingredients and flavours. It is sure a treat for the eyes and is wonderfully tasty. This is one of the recipes which was whipped up by accident as I had to use up a few remaining ingredients and I needed something sweet. The squash lends a mild sweetness and a lovely golden orange colour to this dish. White sesame seeds: 1 tbsp. 1. Peel, chop and steam the butternut squash until soft. Mash to a rough paste. 2.Roast the peanuts and grind it along with the sesame seeds to a coarse powder. Keep it aside. 3.Place a kadai on medium flame. Simmer one cup of water. 4.Add the aval, mashed squash and powdered peanuts and sesame seeds. 5.Cook until done. This will take around 5-6 minutes. 6.Remove from flame and mix the sugar and cinnamon powder. 7.Fry the cashews and raisins in ghee and add to the payasam. Serve warm with a dash of milk . Note: Do not overcook as the aval will turn mushy. Make sure that the peanuts are without the skin. You can substitute sweet potato, carrots, apples and pears for squash. Add chopped dates or dried apricots for a different flavour. If you are preparing this for kids, use whole milk instead of water. Sending this to "Celebrate Sweets- Warm Desserts" an event by Nivedita guest hosted by Priya and to Kurinji's Healthy Recipe Hunt - Aval . 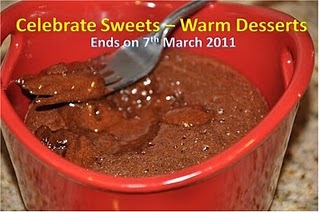 Comforting and yummy.. Great recipe... Love the color and of course your clicks!! Why dont you send it over? Jus' kidding..
Butternut Squash paayasam!!!!!!.... New idea! Super! looks very delish ....can smell the wonderful aroma....yummy! Your payasam looks yummy and colorful. Wow.That is new to me Reva.Will be of yummy flavour.nice clicks too ! Wow that's what I call a killer combo.really something new to me. 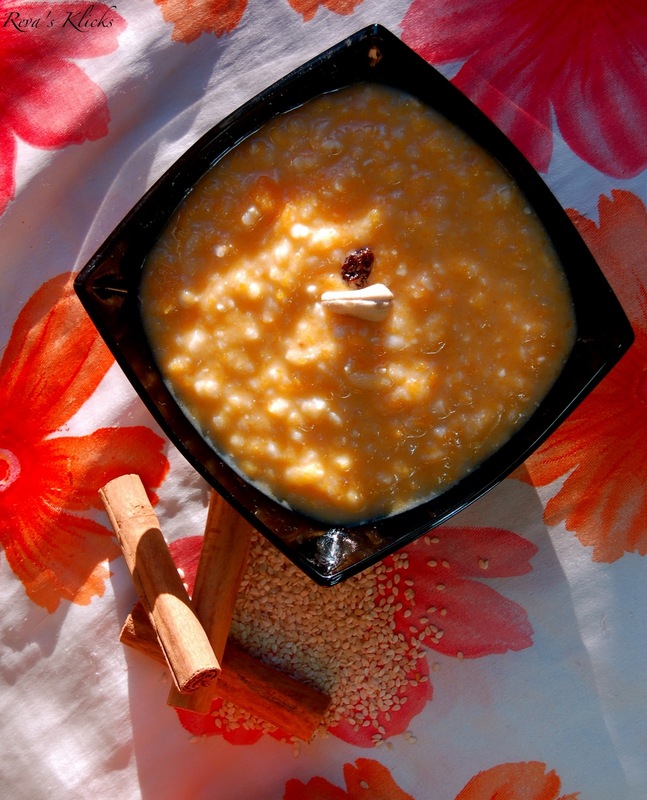 Payasam looks so creamy and delicious.Nice recipe will try out soon. Really innovative payasam and keep rocking Reva...thanks for sending to my event. This looks soo colourful... simple, yet tasty payasam!! Very interesting combo,Reva. Pakkave nalla irukku.. WOW!! Thats an unusual combi but a sure hit im sure!! Aval n butternut squash payasam looks totally yummy.. Very creative and delicious payasam..
very lovely recipe......and great presentation.......I never tried such a lovely sweet...good one..
Hey U have a wonderful blog with innovative recipes and beautiful pictures.Aval payasam is one among them and ur presentation of the dishes are very creative. Hi Reva,this one is highly ingenius.Just lipsmackingly good clicks.Luv it really.Thanks for sharing.